THE NEWS-JOURNAL AND THE LISTENERS OF WNDB NEWS RADIO! NOTICE – WE WILL BE CLOSED DECEMBER 24TH, 25TH, AND JANUARY 1ST. Abracadabra Pet Food & Grooming is a family-owned business providing safe, professional pet care and dog grooming. Under new ownership since summer 2013, Abracadabra remains committed to our family of pet owners who have trusted us for over 40 years to keep their pets radiant and healthy. Come speak with our on-staff Vet Techs to learn how you can help your beloved dog or cat live a long, healthful life. We sell the BEST organic pet foods and treats from USA manufacturers. Our shop is filled with specialty items at very competitive prices. We do the research on healthy, organic dog food so you can focus on spending quality time with your pet. Our pet boutique is stocked with leashes, collars, doggie beds, organic pet food, flea treatments, organic treats, dog apparel & costumes, toys, and pet bathing supplies–all at low prices. In our pet grooming salon we take pride in providing the gentle care and special attention your pet deserves. In addition to dog grooming services, we have a full-line pet store with quality pet foods, treats, pet health care items, and pet accessories. Walk In from 8am to 2pm for nail trims at only $8. Pet grooming appointments can be booked on Monday through Saturday and can be reserved up to one year in advance. 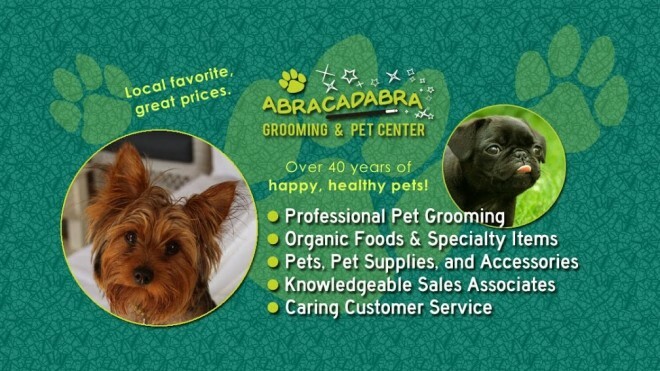 Abracadabra Pet Supplies & Grooming Center is Ormond Beach’s #1 Source for organic, top quality pet food and treats. Come see why pet lovers trust us to care for their pets. In addition to some of your favorite healthy brands, we sell specialty items not available at other stores, all at great prices! We are members of the National Dog Groomers Association.